click for advanced tickets…only $5! Dance with us at the exotic Taj Lounge to the feel good soulful music of DJ Ali Coleman (House Coalition). 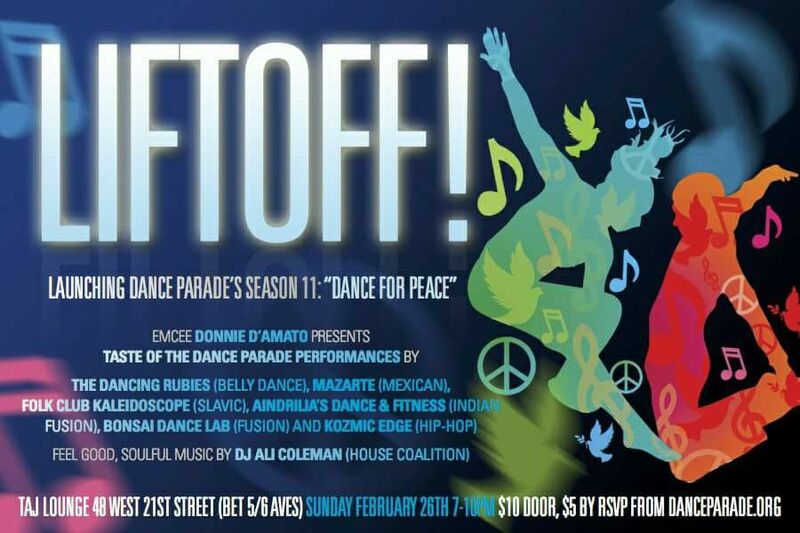 Two riveting performance sets, folkloric to hip-hop, curated to light you up about Dance Parade’s 11th Season. Meet the Movers and Shakers of the 2017 DANCE FOR PEACE Campaign. 100% of proceeds support the artists and Community Engagement programs for deserving kids and seniors. Support the artists best with a donation of $50 or more and get a 2017 commemorative magnet and tote bag! (includes event admission for two). And the hotness of Aindrila Dance & Fitness (Indian Fusion), The Bonsai Dance Lab (Akim Funk Buddha) and Kozmic Edge– A night to remember!